So, the other night during the block of TV time that hosts the crème de la crème of crap I came upon the movieTentacles. I was flooded with excited thoughts... what IS this garbage; how have I never seen this; why does this somehow feel familiar. Final thought, why does this stuff make me so very happy. Then I think I fell asleep about 15 minutes in. I vow to finish what I started by summer's end. Anywho, seeing part of this movie made me think of an actual favorite movie, Jaws, which made me think of the obvious... summer movie season. As someone obsessed with all things movies (and I fear a sometimes deterrent in overcoming laziness, but will nonetheless remain an endless love) I've decided that I'm going to do a weekly post showcasing some of the summer's best/worst/classic/etc offerings. As my list is being compiled I'm noticing it's very 70's heavy but I've come to think that's where the blockbuster trend truly began. 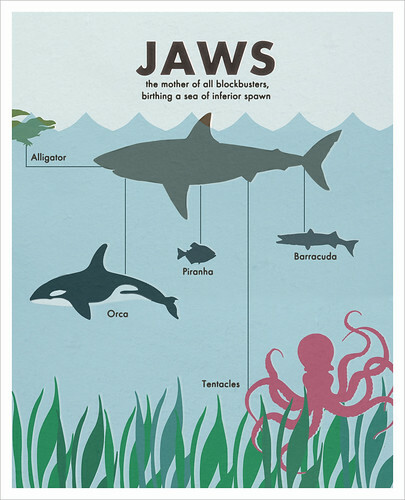 Jaws in many circles is considered to be the movie that started it all, and in regards to this particular post, not only did it raise the bar for event films and sky-high grosses, it buried the bar in its endless "don't go in the water" knock-off inspirations. I wouldn't have it any other way. Behold some choice examples below. P.S. Extra points to the screenplay writers for "Ocean Beach" and "Lost River Lake"... solid names. But maybe that's the least of their transgressions.